Most of the advanced applications of transcranial Doppler (TCD) are possible due to its ability of continuous monitoring of blood flow in an intracranial artery over extended periods. Thus, the dynamic changes in cerebral hemodynamics as a result of the natural history of an intracranial disease and complications of a disease or secondary to an external provocative stimulus can be observed in real time and aid in the diagnostic, therapeutic as well as prognostic processes. Some of these routinely used applications are described in the manuscript. A flow-limiting stenosis in a cervical or intracranial artery can produce cerebral ischemia by regional hypoperfusion, artery-to-artery embolization, or a combination of both. 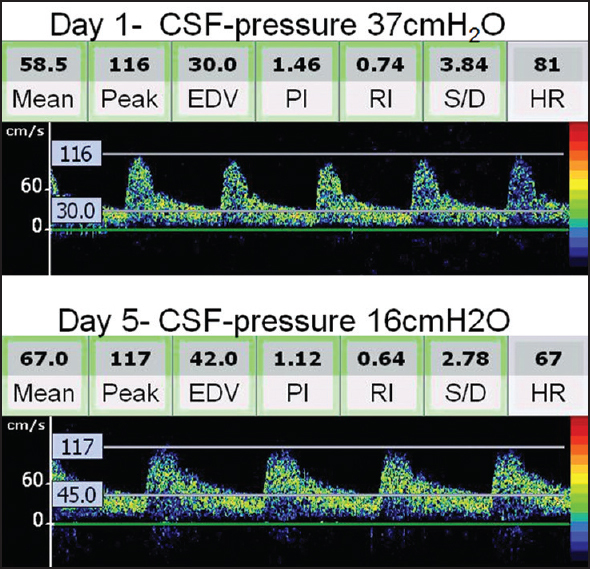 Extended monitoring of an intracranial artery distal to the steno-occlusive site can detect spontaneous embolic signals [microembolic signals (MES)] and quantify the embologenic potential of the atherosclerotic plaque. The best method for monitoring of MES is to use a TCD probe fixation headframe that enables continuous recording of spectral flow from the desired intracranial artery for extended periods. In routine practice, detection of even a single MES during 40 min of monitoring is considered as clinically significant. One example is shown in [Figure 1]. Random occurrence during the cardiac cycle. Brief duration (usually <0.1 s). High intensity (>3 dB over background). Primarily unidirectional signal (if fast Fourier transform is used). Audible component (chirp, whistle, or pop). Patent foramen ovale (PFO) is the commonest source of RLS circulatory shunt, occurring in approximately 25% of the general population. Patients with cerebrovascular ischemia due to paradoxical embolism can undergo TCD "bubble" test to detect RLS. TCD is considered to be more sensitive and specific than transesophageal echocardiography for RLS detection  as well as for quantifying its "functional-potential." Power motion mode in the currently available TCD machines further enhances the sensitivity due to the overlapping and contiguous multiple gates. Grade 1: MES count 1-10. Grade 3: MES count more than 30 with "shower" or "curtain" appearance. Grade 2: MES count 11-30. Grade 3: MES count 31-100. Grade 4: MES count 101-300. Grade 5: MES count more than 300.
where MFV is the mean flow velocity. BHI of <0.69 is considered to represent an impaired cerebral vasodilatory reserve (CVR) regulated by the parasympathetic nervous system. A decreased BHI represents failure of the collateral flow to maintain adequate cerebral perfusion in response to the hypercapnic challenge. It is always advisable to monitor both MCAs simultaneously. A normal flow acceleration in the contralateral (normal) MCA establishes the adequacy of hypercapnic challenge and the expected response in the ipsilateral MCA. BHI can be used to identify patients at a higher risk of stroke among the cohort of asymptomatic carotid stenosis or previously symptomatic carotid occlusion. It can be used to monitor the progression of stenosis as well as to select patients for further neuroimaging and therapeutic decision-making. An example of the clinical use of CVR is shown in [Figure 2]. A value more than 65% indicates normal VMR while the value of less than 33% reflects an exhausted VMR. VMR between 33% and 65% represents borderline impaired autonomic control. Children with sickle-cell disease (SCD) carry a significant stroke risk, with 11% of all homozygous sickle cell (HbSS) patients developing ischemic stroke before the age of 20 years. These strokes primarily result from stenosis or occlusion of the distal intracranial internal carotid arteries and/or proximal MCA. TCD can identify children with the highest risk of the first-ever stroke  and those in need of blood transfusion. In a pivotal trial,  TCD detection of time averaged maximum mean flow velocity of 200 cm/s on two separate examinations was used to determine the need for blood transfusion that resulted in about 90% relative risk reduction of first-ever stroke. The skill of TCD testing in children with sickle cell anemia is taught through standard tutorials with sonographers receiving specialized certificates, and diagnostic criteria for interpreting physicians are well defined. TCD is performed according to stroke prevention in sickle-cell disease (STOP) trial protocol, which is different from routine clinical TCD examination. STOP protocol uses time-averaged mean of the maximum (TAMM) velocities of the MCA, and/or TICA recorded on two separate occasions separated by at least 2 weeks. Transtemporal head diameter is measured and recorded. The nomogram for expected depths for the patient's head diameter is reviewed. Sample volume is set to 6 mm. Velocity scale is set to 200-250 cm/s. Anterior TCD examination begins with the identification of anterior temporal window. MCA signal is acquired and tracked to as shallow a depth as possible; for most children, this should be to a depth less than 40 mm (in STOP, this depth was referred to as M1MCA, indicating the shallowest depth of the MCA that could be recorded). Optimized TCD signal is recorded. MCA stem is then "tracked" by advancing the sample volume by 2-mm increments, optimizing and recording the signal. The MCA is "tracked" (recording in 2-mm increments of depth) to the internal carotid bifurcation (lCA). The anterior cerebral artery (ACA) is tracked to 4-6 mm deeper than the ICA bifurcation and recorded as ACA. The sample volume depth is then returned to the ICA bifurcation, the probe is angled slightly inferiorly, the depth is increased by 4-6 mm, and the Doppler flow velocity waveforms in the distal ICA are recorded, labeled as dICA. The sample depth is then returned to the ICA bifurcation, the probe is angled slightly posteriorly until the posterior cerebral artery (PCA) is detected. The sample volume depth is then decreased to the shallowest depth at which signal can be detected. The PCA is tracked in 2 mm increments to the midline, where bidirectional flow from top of the basilar (TOB) is recorded. The opposite side is then examined (through the transtemporal window) and recorded using this same technique. Posterior examination was performed as per the standard TCD scanning protocol. 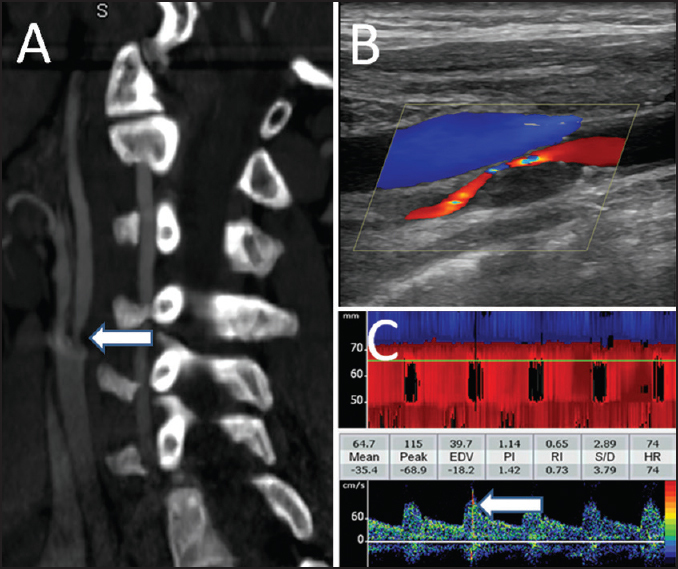 As stenoses only very rarely affect the vertebrobasilar system in children with sickle-cell disease, high velocities here were generally secondary to increased volume flow (collateralization of flow). Ophthalmic TCD was not part of the STOP protocol. Normal: TAMM velocity <170 cm/s - a repeat assessment is indicated. Abnormal: TAMM >200 cm/s in the MCA and/or terminal ICA - urgent blood transfusion is arranged. Clinical evaluation of brain-stem functions with various provocative measures is the gold standard for the diagnosis of brain death. However, the diagnosis of brain death may be delayed considerably if only clinical assessments are considered. This phenomenon could have serious implications, especially in centers involved in aggressive organ transplantation programs. On its own, TCD cannot be used to diagnose brain death since this is a clinical diagnosis. TCD can be used to help in diagnosing cerebral circulatory arrest in adults and children (older than 6 months). TCD can be used to monitor progressive flow changes toward cerebral circulatory arrest. Once a reverberating signal is found, it should be monitored for at least 30 min in the both MCAs and the basilar artery (BA) to avoid false-positive findings. A prolonged absence of brain perfusion can be detected using an oscillating (reverberating) flow pattern, systolic spike, or absent flow signals, and this process will lead to brain death. Document arterial blood pressure at the time of TCD examination. Assess both MCAs (starting depth 50 mm) and BA (80 mm). 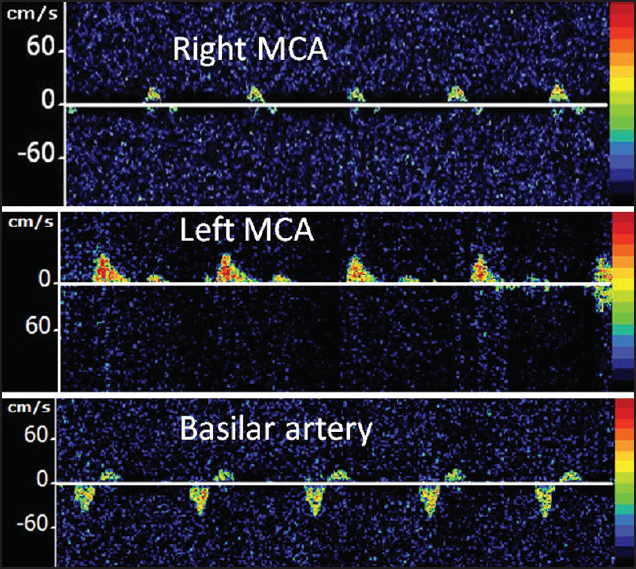 Positive MCA or BA end-diastolic flow is found = No cerebral circulatory arrest. Absent end-diastolic flow = Uncertain cerebral circulatory arrest (too early or too late). Reversed minimal end-diastolic flow = Possible cerebral circulatory arrest [continue monitoring, document diastolic blood pressure (BP) ≥50 mmHg]. Reverberating flow = Probable cerebral circulatory arrest (confirm in both MCAs at 50-60 mm and BA at 80-90 mm). An example of cerebral circulatory arrest on TCD is shown in [Figure 3]. Arterial vasospasm is a complication of subarachnoid hemorrhage (SAH), which becomes symptomatic in more than 25% of patients leading to a delayed ischemic deficit (DID). TCD can be used to detect asymptomatic vasospasm onset, follow spasm progression and facilitate triple-H-therapy, identify patients with severe vasospasm, monitor the effect of therapies and interventions, and detect spasm resolution. Various studies have shown the usefulness of TCD in diagnosing vasospam in anterior and posterior circulations following SAH. , More specifically, TCD can detect the development of vasospasm days before it can become clinically apparent (days 2-5 following SAH onset), and this information can be used by the treating physician. After vasospasm is diagnosed, TCD can help in monitoring its progression and response to various therapeutic measures as well as selecting patients for additional endovascular interventions. Sloan et al. showed that TCD was highly specific (100%) for vertebral and basilar artery vasospasm when mean flow velocities were ≥80 cm/s and ≥95 cm/s, respectively. Based on the available evidence, the Therapeutics and Technology Assessment Subcommittee of the American Academy of Neurology has recently stated that TCD is useful for the detection of vasospasm following spontaneous SAH. First, TCD should be obtained as soon as possible after the diagnosis of SAH. This would include a complete standard TCD with additional flow velocities obtained from the cervical internal carotid arteries (ICA) using the TCD probe via submandibular approach. Flow velocities obtained from the extracranial ICA are used to calculate the Lindegaard's ration (defined as the ration of MFV of MCA and submandibular ICA). The flow velocities obtained from the cervical ICA via a duplex machine are not acceptable since these are obtained at about 60° insonation angle. TCD evaluations using a standardized protocol should be used on a daily (or even more frequently) basis to monitor the progress of vasospasm. In patients with vasospasm, especially if a change in the treatment approach was made due to TCD findings, TCD should be repeated within 6-8 h to evaluate the effect of treatment. Information about intracranial pressure, if available, should be taken into account during the interpretation of TCD findings. In case of doubtful findings, other imaging modalities should be employed. The established diagnostic criteria ([Table 1] shows the diagnostic criteria for MCA vasospasm used at National University Hospital, Singapore) should be used for the diagnosis and monitoring of vasospasm. Depending upon the clinical requirement, ICP measurement or monitoring is performed via intraventricular drain, hollow skull bolt, or lumbar puncture. However, the invasive nature of these methods limits their routine use. TCD is noninvasive that can evaluate cerebral blood flow hemodynamics in major intracranial arteries at the bedside. TCD-derived pulsatility index (PI), calculated as the difference between flow velocities measured during systole (Vs) and diastole (Vd), divided by the mean flow velocity (Vm) [(Vd-Vs)/Vm], provides useful information about ICP. However, this relationship is complex and dependent on a number of physiological factors and disease states. In a recent study, we performed TCD simultaneously with lumbar puncture and looked into the relationship between TCD-PI and opening pressure. We found that TCD-PI has acceptable accuracy parameters in differentiating patients with ICP of more than 20 cm of cerebrospinal fluid. Interestingly, serial estimations in a single patient over short period of time are reliable for an indirect assessment of longitudinal changes in ICP. An example for the use of TCD in the assessment and monitoring of ICP is shown in [Figure 4]. TCD provides real-time information about cerebral hemodynamics and permits extended monitoring with excellent temporal resolution. Advanced applications of TCD are integral parts of the armamentarium of neurologists for evaluating various mechanisms of cerebral ischemia. Furthermore, TCD helps in planning and monitoring the disease process, effectiveness of treatment as well as aids in establishing the prognosis. Sharma VK, Tsivgoulis G, Lao AY, Alexandrov AV. Role of transcranial Doppler ultrasonography in evaluation of patients with cerebrovascular disease. Curr Neurol Neurosci Rep 2007;7:8-20. Yeo LL, Sharma VK. Role of transcranial Doppler ultrasonography in cerebrovascular disease. Recent Pat CNS Drug Discov 2010;5:1-13. Spencer MP, Thomas GI, Nicholls SC, Sauvage LR. 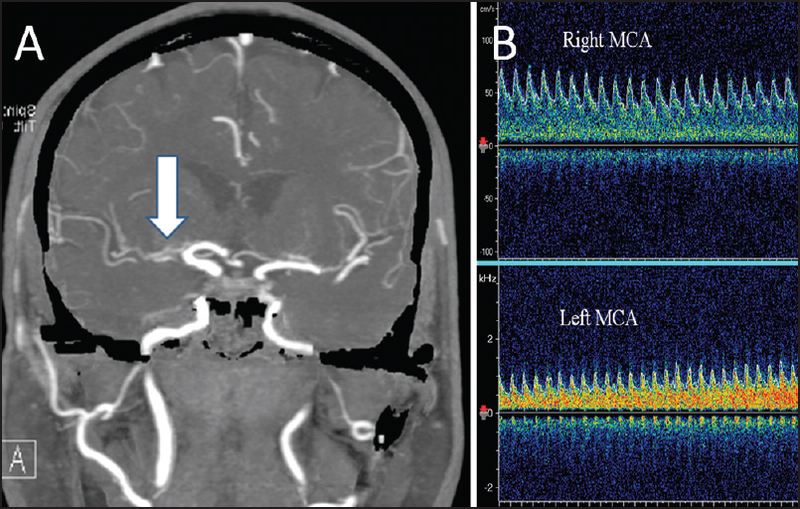 Detection of middle cerebral artery emboli during carotid endarterectomy using transcranial Doppler ultrasonography. Stroke 1990;21:415-23. King A, Markus HS. Doppler embolic signals in cerebrovascular disease and prediction of stroke risk: A systematic review and meta-analysis. Stroke 2009;40:3711-7. Markus HS, Droste DW, Kaps M, Larrue V, Lees KR, Siebler M, et al. Dual antiplatelet therapy with clopidogrel and aspirin in symptomatic carotid stenosis evaluated using doppler embolic signal detection: The Clopidogrel and Aspirin for Reduction of Emboli in Symptomatic Carotid Stenosis (CARESS) trial. Circulation 2005;111:2233-40. Wong KS, Chen C, Fu J, Chang HM, Suwanwela NC, Huang YN, et al. ; CLAIR Study Investigators. Clopidogrel plus aspirin versus aspirin alone for reducing embolisation in patients with acute symptomatic cerebral or carotid artery stenosis (CLAIR study): A randomised, open-label, blinded-endpoint trial. Lancet Neurol 2010;9:489-97. Jauss M, Kaps M, Keberle M, Haberbosch W, Dorndorf W. A comparison of transesophageal echocardiography and transcranial Doppler sonography with contrast medium in the detection of patent foramen ovale. Stroke 1994;25:1265-7. Belvís R, Leta RG, Martí-Fàbregas J, Cocho D, Carreras F, Pons-Lladó G, et al. Almost perfect concordance between simultaneous transcranial Doppler and transesophageal echocardiography in the quantification of right-to-left shunts. J Neuroimaging 2006;16:133-8. Lao AY, Sharma VK, Tsivgoulis G, Malkoff MD, Alexandrov AV, Frey JL. Effect of body positioning during transcranial Doppler detection of right-to-left shunts. Eur J Neurol 2007;14:1035-9. Lao AY, Sharma VK, Tsivgoulis G, Frey JL, Malkoff MD, Navarro JC, et al. Detection of right-to-left shunts: Comparison between the international consensus and spencer logarithmic scale criteria. J Neuroimaging 2008;18:402-6. Markus HS, Harrison MJ. Estimation of cerebrovascular reactivity using transcranial Doppler, including the use of breath-holding as the vasodilatory stimulus. Stroke 1992;23:668-73. Silvestrini M, Vernieri F, Pasqualetti P, Matteis M, Passarelli F, Troisi E, et al. Impaired cerebral vasoreactivity and risk of stroke in patients with asymptomatic carotid artery stenosis. JAMA 2000;283:2122-7. Low SW, Teo K, Lwin S, Yeo LL, Paliwal PR, Ahmad A, et al. Improvement in cerebral hemodynamic parameters and outcomes after superficial temporal artery-middle cerebral artery bypass in patients with severe stenoocclusive disease of the intracranial internal carotid or middle cerebral arteries. J Neurosurg 2015;123:662-9. Adams R, McKie V, Nichols F, Carl E, Zhang DL, McKie K, et al. The use of transcranial ultrasonography to predict stroke in sickle cell disease. N Engl J Med 1992;326:605-10. Practice parameters for determining brain death in adults (summary statement). The Quality Standards Subcommittee of the American Academy of Neurology. Neurology 1995;45:1012-4. Sviri GE, Ghodke B, Britz GW, Douville CM, Haynor DR, Mesiwala AH, et al. Transcranial Doppler grading criteria for basilar artery vasospasm. Neurosurgery 2006;59:360-6. Sloan MA, Haley EC Jr, Kassell NF, Henry ML, Stewart SR, Beskin RR, et al. Sensitivity and specificity of transcranial Doppler Utrasonography in the diagnosis of vasospasm following subarachnoid hemorrhage. Neurology 1989;39:1514-8. Sloan MA, Burch CM, Wozniak MA, Rothman MI, Rigamonti D, Permutt T, et al. Transcranial Doppler detection of vertebrobasilar vasospasm following subarachnoid hemorrhage. Stroke 1994;25:2187-97. Wakerley BR, Kusuma Y, Yeo LL, Liang S, Kumar K, Sharma AK, et al. Usefulness of transcranial Doppler-derived cerebral hemodynamic parameters in the noninvasive assessment of intracranial pressure. J Neuroimaging 2015;25:111-6.